Never before has there been such a dizzying array of toothbrushes on the market. Consumers are inundated with new designs, materials, attachments, and colors. Whatever toothbrush design you choose, the most important thing is that you use the toothbrush at least 2-3 times a day. Moreover, how long you spend brushing your teeth is as critical as how often you brush. This ensures complete plaque removal in hard to reach areas. Our dental team highly recommends a mechanical (electric) toothbrush. The pulsations break up plaque efficiently. Many models now have timers to remind you to brush longer. It is always nice to have a backup manual toothbrush. 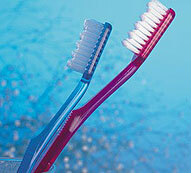 When choosing a manual toothbrush, look for a compact head with very soft, rounded bristles.